Early Monday morning, Pebble announced a new partner to help carry its mining project through at least the permitting phase. First Quantum Minerals is a Canadian-based company that currently operates seven mines and one copper smelter across six countries, including a large copper project in Panama. First Quantum has agreed to buy in at $150 million, paid in four installments over the next four years. Collier said this will fund Pebble through the permitting phase. Anglo American was the other half of Northern Dynasty’s Pebble Limited Partnership until Anglo abruptly backed out in 2013. Prior to that, Anglo had put more than $500 million towards exploration and the environmental baseline study. Its departure was nearly a death blow for the controversial copper and gold project: the EPA under President Obama was finishing Clean Water Act restrictions to block Pebble preemptively, Northern Dynasty’s stock price plummeted and the company just about ran out of money to fight any battles. 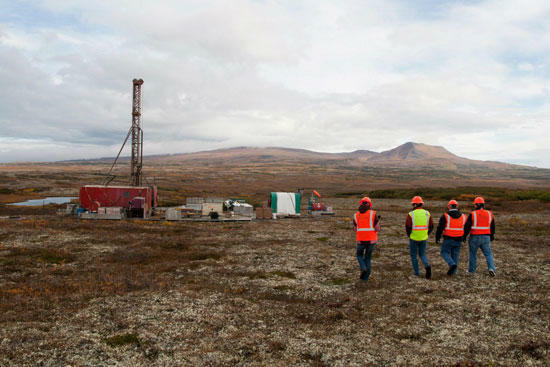 Almost all exploration work at the site northwest of Iliamna stopped for three years. The situation turned around in 2017, in large part due to a new EPA under President Trump. Pebble and EPA settled a lawsuit to allow a normal permitting process, new investments brought in millions of dollars, the company unveiled a smaller mine design, and now named a new partner. “We have every confidence that Pebble can be developed safely and in a manner that protects and coexists with the important fishery resources,” First Quantum president and CEO Philip Pascall said in a conference call with investors Monday morning. Having been in talks with Pebble for about a year, he acknowledged the many hurdles he knows lie ahead. But Pascall said Pebble is on the right track, and the U.S. has a solid permitting regime. “The EPA and other agencies have studied our region extensively and the conclusion is clear: Bristol Bay’s wild salmon fisheries warrant special protections. It is disappointing that another mining company would join Northern Dynasty in its ongoing effort to fight scientific fact and the will of Bristol Bay’s people,” Ralph Anderson, president and CEO of BBNA, wrote. Mark Niver, a Bristol Bay drift permit fisherman from Wasilla, said the opposition is only building. “We’ve really shouldered together, I mean everybody within the fishing industry in particular, just to say, ‘Hey, this fishery is way too great to risk anything at all,'” Niver offered Monday morning. Niver also works on the North Slope and is not anti-development, but believes Pebble presents an unreasonable risk to uniquely healthy salmon habitat. Not all leadership in the Bristol Bay region weighs in for each development of the Pebble saga. The deposit sits on state lands inside the Lake and Peninsula Borough, which keeps a neutral position on account of its own permitting process. Others, like Lisa Reimers, cheered the announcement Monday. Reimers is CEO of Iliamna Development Corporation and a board member of Iliamna Natives Limited. “Finally, Pebble was able to find a partner, which allows them to file for their permits. This is good news because now everyone will be able to commit on actual plans, not speculations,” Reimers said. Reimers is not for or against Pebble, but said she trusts the permitting process and believes the next phase will bring needed work and jobs to Bristol Bay. In settling with EPA and naming a new partner, Pebble has now crossed off two of its three stated goals for 2017. The third is actually filing for permits: First Quantum’s Pascall, in his call with investors Monday morning, said he believed that would happen in the next several days.